As we celebrate our birthday, we look back at the incredible changes that shaped the food and beverage industry since 1940. Russell Putman published the first iteration of our magazine in 1940, "to keep process production men abreast of the latest developments in new equipment, new machines and new products … and be filled with terse news facts in an easy-to-read style." Back then, America was recovering from the worse recession in history. But that didn't stop his entrepreneurial spirit. Opportunity abounded. There was very little in the way of R&D, packaging technology and gleaming equipment to produce food quickly. Globalization of food wasn't on the radar, local was the mantra and mom spent most of her time in the kitchen, basic as it was. There was no Internet, no TV, not even supermarkets. It wasn't long before the U.S. entered World War II, and the government suspended production of most food equipment. Instead, production turned to war machinery. But the technology created to help win the war spurred the largest and most successful addition to our economy – the processed food industry. Colonel Putman is long gone but, since the 1970s, the Cappelletti family has published Food Processing, never missing an issue. To celebrate our 70th anniversary, we thought we'd bring you a timeline of some of the most interesting developments in the food industry since our founding. We hope you enjoy the read, and thank you for your participation in our success. We salute you! Putman Publishing Co. creates Food Equipment Preview magazine. FDA transferred from the Dept. of Agriculture to the Federal Security Agency, with Walter Campbell appointed as the first Commissioner of Food and Drugs. M&M's Plain Chocolate Candies introduced. Legend has it they are developed so soldiers can eat candy without getting their hands sticky. Rex Whinfield and James Dickson in Manchester, England, develop polyethylene terephthalate (PET or PETE). Borden's iconic Elsie the Cow eats one of gossip columnist Hedda Hopper's hats and cavorts with the Radio City Rockettes. In her heyday, she is besieged with fan mail. General Food Corp.'s Maxwell House instant coffee supplied to U.S. troops; sold to consumers in 1945. U.S. issues enrichment guidelines on adding iron, B vitamins, thiamine and riboflavin to bread and other grain products to offset nutrient deficiencies. To encourage banana consumption, the United Fruit Co. creates colorful spokesfruit Chiquita Banana. The first microwave oven weighs in at 670 lbs., stands 62 inches tall and measures nearly 2-feet deep and wide. It sells for more than $2,000, the equivalent of about $20,000 today. Raytheon builds prototype for reheating meals on airplanes. Cherry Burrell Corp. develops continuous pasteurization system. It produces 7,000 lbs of butter from cream to final package in two hours. More than 400 million pounds of frozen vegetables begin to compete in grocery stores with canned veggies. Pillsbury Pie Crust Mix, Hot Roll Mix and Cake Mix debut to the delight of moms. Reynolds Metals Co. uses surplus aluminum from World War II to make Reynolds Wrap aluminum foil. Putman Publishing Co. changes name of Food Equipment Preview to Food Processing Preview. Made with real dairy cream, Reddi-Whip is the first major U.S. aerosol food product. Nestle USA launches Nestea instant tea and Nestle Quik Chocolate Powder. Mascot and dog puppet Farfel sings "N-E-S-T-L-E-S Nestle's makes the very best…chocolate." Campbell Soup Co. introduces V-8 Cocktail Vegetable Juice. Technology for making frozen concentrate orange juice is patented by members of the Florida Citrus Commission. Cheetos brand cheese-flavored snack invented by the Frito Co.
FDA publishes guidance to industry for the first time. "Procedures for the Appraisal of the Toxicity of Chemicals in Food"; becomes known as the "black book." To celebrate the company's 80th birthday, Pillsbury holds the "Grand National Recipe and Baking Contest." The overwhelming response sparks the Pillsbury Bake-Off Contest. Sara Lee Cheese Cake, named after the daughter of baker Charles Lubin, introduced. After years of rationing, consumption of meat, poultry and dairy soar to new levels. Cake mixes, developed by General Mills and Pillsbury, make it easier for families to celebrate. Refrigeration and the rise of suburbia lead to the creation of supermarkets. America's new highway system allows for more efficient distribution of food and the rise of fast food chains. Television becomes the entertainment of choice, and Zenith invents a remote control device, appropriately called Lazy Bones. Sales of new kitchen appliances go through the roof, prepared foods proliferate and more convenient packaging makes food preparation less time consuming. Minnesota Valley Canning Co. becomes Green Giant Co.
Swanson's introduces first frozen Chicken Pot Pie, and sells 5,000 units in its first year, and 10 million in its second year. Putman Publishing Co. changes name of Food Processing Preview to Food Processing. Clarence Birdseye introduces first frozen peas. Mrs. Paul's debuts frozen fish sticks. Kraft's Cheez Whiz introduced. Originally created as an easy way to make Welsh rarebit, this stable cheese sauce comes in a jar with Worcestershire sauce, mustard flour and orange coloring. A survey finds 1,300 possible uses for the product. C.A. Swanson & Sons introduces the first TV dinner: roast turkey with stuffing and gravy, sweet potatoes and peas. It sells for 98 cents and comes in an aluminum tray (few kitchens had microwave ovens). Supposedly, executive Gerald Thomas comes up with the idea when the company has tons of leftover turkey from Thanksgiving. Swift's Butterball brand and self-basting turkey introduced. Through genetics, Swift develops a broad-breasted bird without the tough tendons and uses a hot-water bath to remove feathers. The Tappan Stove Co. introduces the first microwave oven for home use. It features a more compact but less powerful microwave generating system. Price tag is $1,300. Ray Kroc opens the first franchised McDonald's in Des Plaines, Ill. On opening day, a two-patty hamburger is 15 cents and french fries are 10 cents. Instant oatmeal invented by the Quaker Oats Co.
General Foods introduces Tang breakfast beverage crystals. Initially intended as a breakfast drink, sales didn't take off until NASA takes it on an orbit around the Earth in 1965 on John Glenn's Friendship 7 Mercury flight. A market crisis looms with the first widespread public interest in dietary fats and cholesterol. An article in Food Processing warns consumers soon will be asking, "Which foods can I buy that contain the ‘good' type of fat?" For the first time, margarine sales exceed those of butter. Jolly Green Giant born. He appears on TV, but he looks like a monster and scares kids. So they lighten him up a bit, add "Ho, ho, ho" and a catchy jingle. Sweet 'n Low introduced as an artificial sweetener (granulated saccharin, dextrose, cream of tartar and calcium silicate), and receives U.S. trademark patent no. 1,000,000. Diet Rite, the first diet soft drink, introduced by the Royal Crown Co.
FDA publishes the first list of substances generally recognized as safe (GRAS) in the Federal Register. The list contains nearly 200 substances. High-fructose corn syrup, a substitute for sugar, lowers the costs for food producers. The food industry makes the supply chain more efficient, creates products and technologies that cost less and uses its marketing expertise through advertising to show consumers the added value of food products. Aluminum cans first used commercially for foods and beverages. Coca-Cola introduces the 12-oz can. Boiling bags – frozen plastic packages of food that can be dropped in boiling water to heat them for serving – introduced. Green Giant enters the frozen food business with peas, corn, green beans and baby Lima beans in pouches with butter sauce. Star-Kist Foods brings Charlie the Tuna onboard. Frito-Lay Inc. formed by the merger of the Frito Co. and the H. W. Lay Co.
General Foods Corp. introduces jingle, "Oh I wish I were an Oscar Meyer weiner …"
Ermal Cleon Fraze revolutionizes the beverage industry with his invention of pull-tab openers for cans. He sells his invention to Alcoa. Schlitz Brewing Co. introduces first pop-top beer can. Coca-Cola introduces Tab, its first diet soft drink; Diet Pepsi follows next year. Irradiation used for the first time to sterilize dried fruits and vegetables, in order to stop sprouting and control insect infestation. Plastic milk container introduced commercially. PepsiCo founded through a merger of Pepsi-Cola Co. and Frito-Lay. Giggling his way to stardom, Pillsbury Doughboy Poppin' Fresh is born in the offices of Leo Burnett. Raytheon introduces the first domestic countertop 100-volt microwave oven, which costs just under $500, and the market explodes. Raytheon, under the Amana brand name, becomes the dominant player in the home microwave oven business. Easy Open Front Ring pull-tab introduced to Spam can. Gatorade, the original sports drink, developed by the University of Florida for their football team. Food Processing introduces Foods of Tomorrow section. Among the first items: fruit and spice microcapsules with full flavor impact at the moment of consumption. Alexander Liepa invents Pringles, packaged in a tubular can with a foil-coated interior and a resealable plastic lid. His children later honor his request by burying part of his cremated remains in a Pringles container in his grave. Cyclamate, a non-caloric sweetener, is banned by FDA after it's found to cause cancer in laboratory rats. Cyclamate is still used in many countries around the world. Carnation Spreadables – canned, meat-based sandwich spreads -- go to the moon on Apollo 11. General Foods introduces Hamburger Helper, which stretches a pound of hamburger to feed a family of five. Americans hunger for more spice and flavor, and begin experimenting with Vietnamese and Chinese food. Chef Alice Waters at Chez Panisse fuels a food revolution by cooking with natural, seasonal ingredients, an almost forgotten concept because of the packaged-food boom. As Americans spend more time in front of the TV, they begin to pack on the pounds, so industry responds with "lite" products. USDA develops the first standard nutrition label, and health and disease prevention begins to appear on the consumer radar. Tracking consumer purchase behavior becomes commonplace, and the computer technology revolution begins. Nearly 11 million Americans live alone, a 54 percent increase from 1960. Birth rates drop by 22 percent, and the divorce rate increases 20 percent during the decade. Orville Redenbacher introduces his Gourmet Popping corn. Starbucks founded at Pike Place Market in Seattle by Howard Schultz. Nathaniel Weyth receives patent for PET beverage bottles. This is the first safe plastic strong enough to hold carbonated beverages without bursting. DuPont will create the first commercial soda bottle two years later. Nestle acquires Stouffer's. Nestle also debuts Friskies Mighty Dog, the first single-serve canned dog food. Pepsi-Cola is first consumer product manufactured, distributed and sold in the former Soviet Union. On June 26, at a Marsh Supermarket in Troy, Ohio, a 10-pack of Wrigley's Juicy Fruit is run through a hand-made laser scanner – the first use of supermarket scanners. 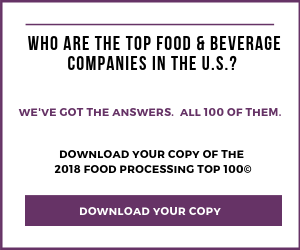 By the end of the year, 1,000 food & beverage companies are registered and have assigned codes. Miller rolls out Miller Lite, the first major-label light beer (Rheingold and Meister Brau had tried it earlier). FDA bans Red No. 2 color in food. Fortified cereal products and fiber-added products hit the shelves. Beech Nut becomes the first baby food company to remove added salt, in addition to added refined sugar, beginning the "natural" baby food movement. Coca-Cola, the only packaged drink allowed in the country, introduced to China. Green Giant merges with the Pillsbury Co.
Microwave ovens are in almost every home, and the industry responds with a tremendous variety of frozen meals in plastic containers designed for microwave cooking. Health and obesity concerns are heightened, and industry responds with lower-calorie products. The January issue of Food Processing predicts the next 10 years will be "the decade of nutrition guidelines, fortification guidelines and nutritional labeling." G.D. Searle's aspartame approved; marketed as NutraSweet, it quickly replaces saccharin in diet soft drinks. Nestle debuts Lean Cuisine calorie-controlled frozen entrees. PepsiCo introduces Pepsi Free and Diet Pepsi Free, the first caffeine-free colas by a major brand. On a lark, Paul Newman and A.E. Hotchner found Newman's Own. After taxes, all proceeds are donated to educational and charitable organizations. LaBatt Brewing Co. introduces the twist-off cap on a refillable bottle. Modified Atmosphere Packaging (MAP) enters marketplace. Philip Morris Cos. Inc purchases General Foods Corp. for $5.6 billion. R.J. Reynolds buys Nabisco Foods for $4.9 billion, creating RJR Nabisco. Coca-Cola introduces New Coke, a sweeter formula. Three months later, after consumer backlash, Coca-Cola "Classic" returns. Snapple introduces bottled iced tea, beginning a new soft drink category. Philip Morris Cos. purchases Kraft for $12.9 billion. Food and Drug Administration Act of 1988 officially establishes FDA as an agency of the Dept. of Health and Human Services. Minnesota adopts the blueberry muffin as the state muffin and designates it into law as Minnesota Statute 1.1496.00. ConAgra rolls out Healthy Choice, a line of low-fat, low-cholesterol, low-sodium foods developed after CEO Charles Harper has a heart attack. General Foods and Kraft merge to become Kraft General Foods. Microwave packaging becomes more sophisticated and simulates conventional ovens for slow-cooking and browning. On the health front, food & beverage companies roll out nutraceutical and functional food products, energy bars, fortified drinks and fat-free, low-fat or reduced fat foods. Nutrition Labeling and Education Act requires all packaged foods to bear nutrition labeling, and all health claims for foods must be consistent with terms defined by the Secretary of Health and Human Services. The food ingredient panel, serving sizes and terms such as "low fat" and "light" are standardized. Coca-Cola introduces first bottle made with recycled plastic, an industry innovation. Frito-Lay launches Sunchips, its first multigrain snack. Nabisco introduces Snackwell line of reduced-fat baked goods. USDA introduces the first Food Guide Pyramid. Nutrition Facts panel (from 1990) now is required. China gets cheese-less Cheetos, the first time a major snack-food brand is changed in China for Chinese tastes. Cadbury-Schweppes buys Snapple for $1.7 billion. Cadbury Schweppes completes takeover of 7Up. Betty Crocker's portrait is updated for the seventh time in eight decades, the latest rendition created in honor of her 75th birthday. Frito-Lay buys the 104-year-old snack, Cracker Jack, the icon candy-coated mix of popcorn and peanuts, from Borden Foods Corp.
PepsiCo acquires Tropicana Products from Seagram Co. Ltd., the biggest acquisition ever undertaken by PepsiCo. FDA approves two new cholesterol-lowering margarines -- Benecol (a plant stanol ester derived from pine trees) from McNeil Consumer Health Care and Take Control (a soybean extract plant sterol ester) from Unilever Plc's Lipton. Dean Foods Co. introduces its Milk Chug plastic single-serve package, designed to counter flagging per capita fluid milk consumption. Fewer dollars spent on R&D and consolidation mean fewer employees must do more work. Product development times are shorter, and there is less time to build brands – which are under fire from less expensive, private label products. Foods are marketed to generational niches, especially aging baby boomers, and health solutions turn to reducing sodium and adding probiotics, fiber, and omega-3s. Kraft General Foods acquires Nabisco Holdings Corp. for $19.2 billion. International Multifoods acquires Pillsbury dessert and baking mix business. PepsiCo acquires South Beach Beverage Co., whose innovative SoBe brand makes it one of industry's most successful companies, for $370 million. General Mills acquires the Pillsbury Co. and Green Giant. Nestle acquires Ralston Purina pet foods. PepsiCo Inc. acquires The Quaker Oats Co.
Mad Cow disease spotted in Canada; curiously it doesn't affect U.S. meat consumption. To help consumers choose heart-healthy foods, the FDA requires food labels to include trans fat content, the first substantive change to the nutrition facts panel since the label was inaugurated in 1993. An obesity working group established by the Commissioner of Food and Drugs. The Food Allergy Labeling and Consumer Protection Act requires the labeling of any food that contains a protein derived from peanuts, soybeans, cow's milk, eggs, fish, crustacean shellfish, tree nuts and wheat. J.M. Smucker Co. acquires International Multifoods for $840 million. Nestle acquires Chef America (Hot Pockets, Lean Pockets, Croissant Pockets) for $2.6 billion. Nestle takes full ownership of Dreyer's ice cream; also enters weight management market with acquisition of Jenny Craig for $600 million. Nestle completes acquisition of Gerber baby food brand for $5.5 billion. Tropicana launches Tropicana Healthy Heart with Omega-3s, the first national orange juice to include omega-3s. Walkers (PepsiCo's British chips brand) becomes the first major food brand in the world to display a carbon footprint reduction logo on its packs. Altria Group Inc., formerly Philip Morris Cos., spins off Kraft Foods. FDA issues non-objection letters on new sweetener stevia; within days, Cargill Inc. (teamed with Coca-Cola) rolls out Truvia and Whole Earth Sweetener/Merisant (teamed with PepsiCo) debuts PureVia. Frito-Lay SunChips begins using the first fully compostable snack chip bag made from plant-based materials to significantly improve the environmental impact. Kraft Foods buys Cadbury for $19 billion. Nestle acquires Kraft's frozen pizza business for $3.7 billion. Betty Crocker Cookbook available for the iPad mobile digital device, featuring 2,500 of the most popular Betty Crocker recipes, high-resolution images and step-by-step cooking instructions. Consumers take to social media sites like Facebook and Twitter to remark on the loudness of Frito-Lay's SunChips compostable bag. Frito-Lay stops production of the compostable snack chip bag.